I LOVE the subtle, pretty look that watercolor gives, but I have yet to try it out. It’s one of those things that I say I wanna learn ‘when I have the time’… but just haven’t had the time! These 5 techniques she shares make it seem like a breeze for starters though, and I’m looking forward to trying them out! Even with all the desktop software and mobile to-do lists available nowadays, I still love writing things down by hand! 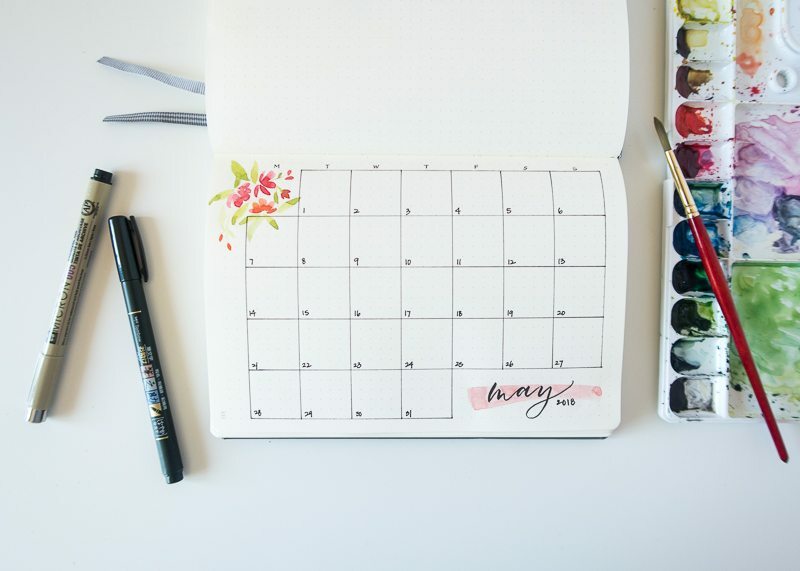 When I first started my small business I started planning with a bullet journal. 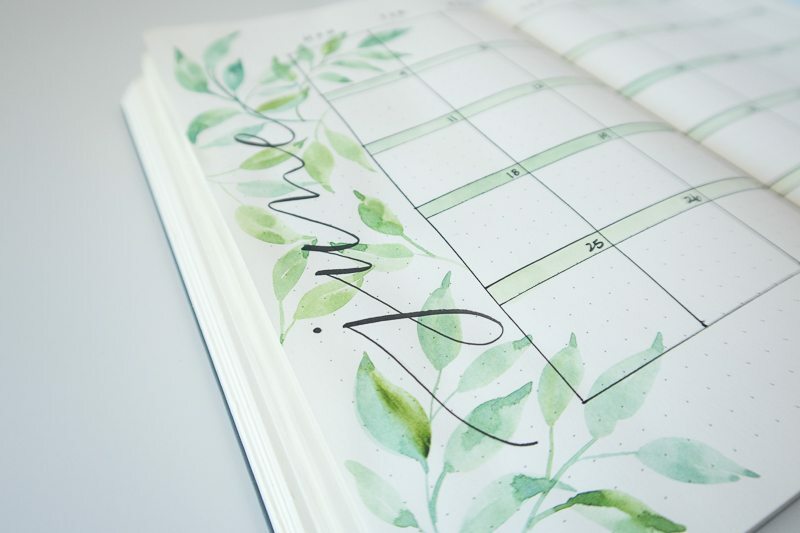 While I’ve since settled into using an undated planner, I still love seeing how others decorate and use their journals. Whitney is so creative with her layouts and I love seeing what she comes up with! 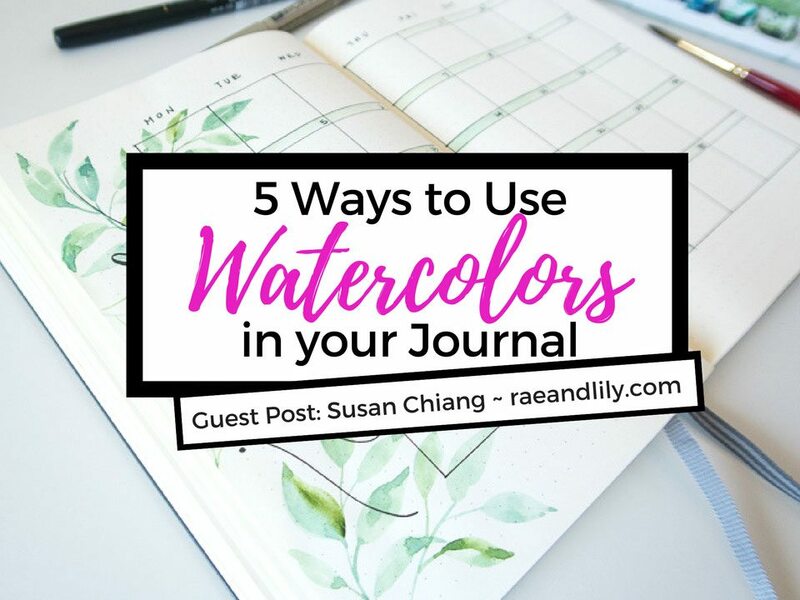 I’m excited to be here sharing a few ideas on how to use watercolor in your bullet journal here on the blog. So let’s get started! 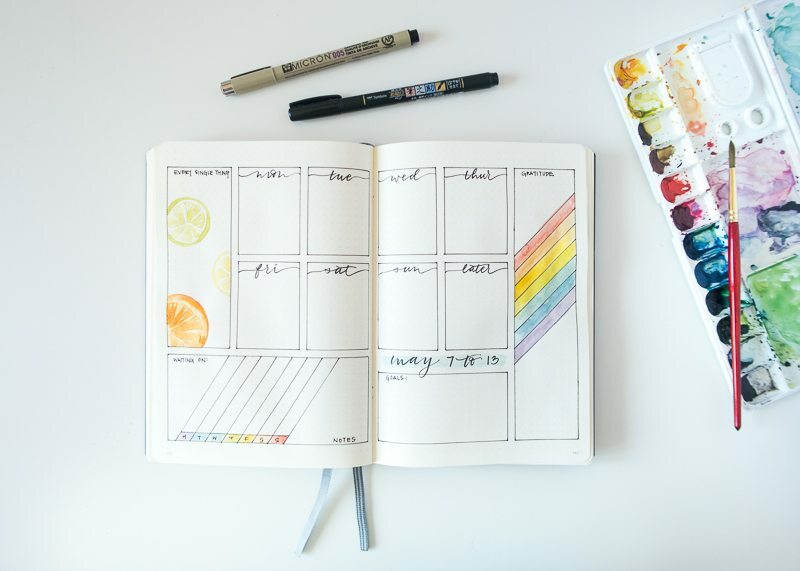 Read on for 5 ways to use watercolors in your bullet journal. So watercolors involves using water (obviously) and paint. And we all know that our journals don’t usually have the thickest type of paper. Watercolors painted on watercolor paper yields the most beautiful results because of the way the paper absorbs the water and pigments. 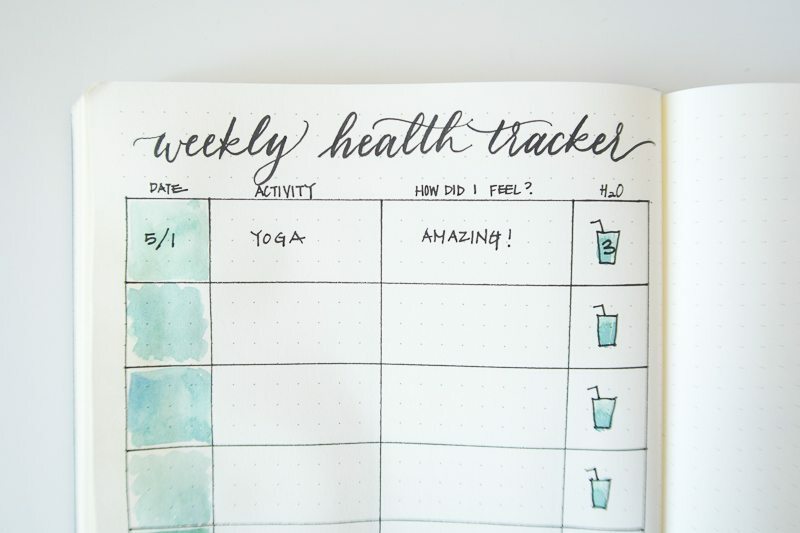 However, you can still achieve beautiful results using watercolors in your bullet journal, you just have to be mindful of how much water you are using. I painted all of the examples you see in this post with watercolors in my Leuchtturm 1917 dotted journal. I didn’t paint as “wet” as I usually do on watercolor paper and it worked out great! Like I said, just do some testing and be mindful of how much water you are using if you decide to try this out in your bullet journal! Even if you don’t know how to watercolor, you can take a watercolor brush with some paint and make one bold stroke across any title you want to highlight. Here I used a waterproof brush pen to letter the date, and then did a title wash using the belly/or side of my round-tip brush. Just one stroke is all it takes! I really love the look of this minimal color accent! It’s quick and super easy. If you’re afraid of using too much water, go for small illustrations to decorate empty corners and borders of your pages. 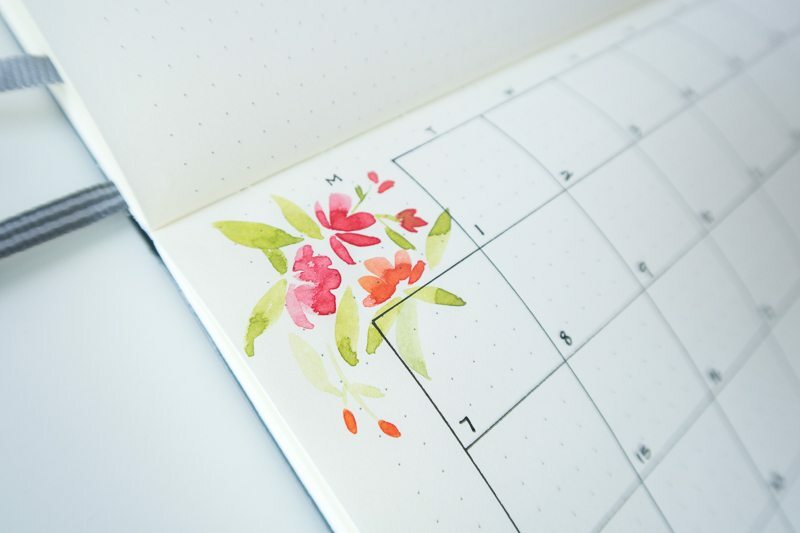 I added some small flowers and leaves to the monthly layout that Whitney shared recently a YouTube video. 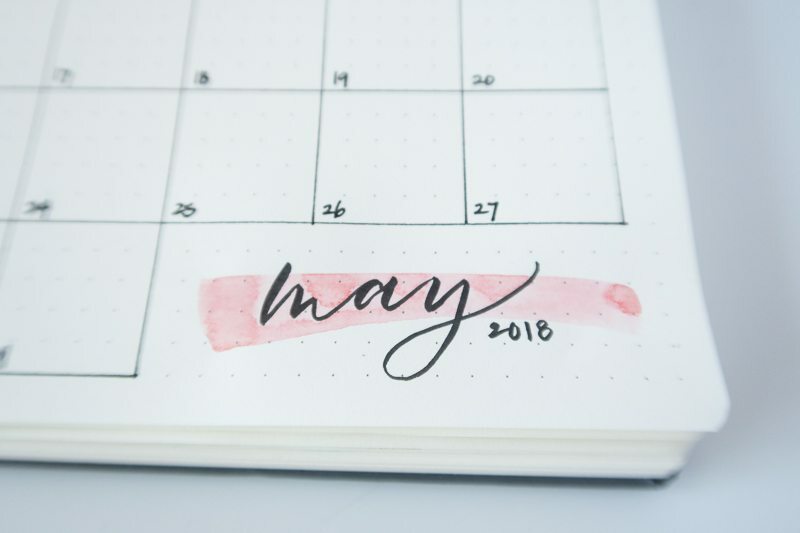 I love themed monthly pages, so flowers seemed appropriate for this May layout! I love seeing what people draw into their bullet journals. If you like to doodle (make sure you’re using waterproof pens) a fun way to use watercolors is to “color in” your ink drawings. I found this tracker layout in Whitney’s Resource Center! And added a cup illustration that I could watercolor in the H2O column! You can definitely do this with markers too – but let’s say you wanted a light, almost barely-there color that you can’t get with a marker (or you don’t own that color). You could mix up a very light wash (use less paint and more water in your ratio) and create your own custom color! I love the look of watercolor backgrounds. Like I mentioned before, you have to be careful with the amount of water you use in your journal for these, but even a light wash adds a lot of character to your page. 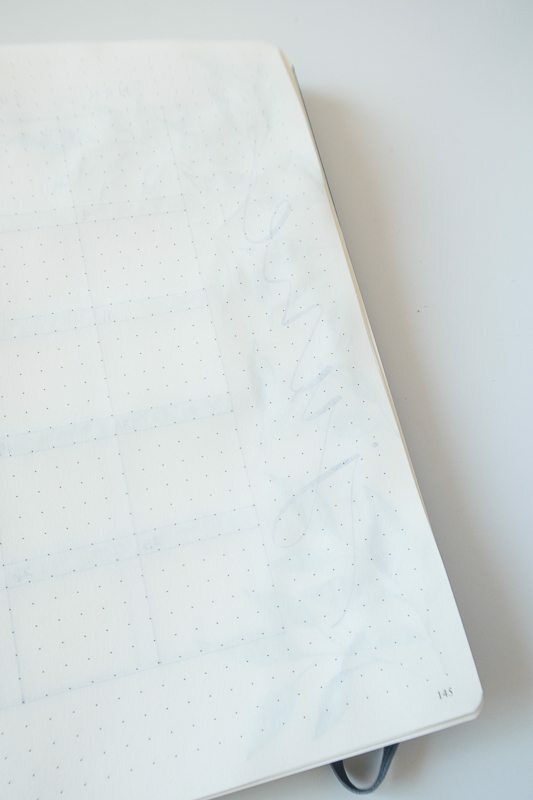 Just keep in mind that if you’re covering a large area with watercolors in your journal it may cause the paper to turn a little wrinkly after drying! Here’s some fun rainbow colors I used on a weekly spread that I found on Whitney’s Instagram! I call these “graphic” illustrations, but what I really mean is that you’re painting a large area with watercolors so that it serves as a big graphic. If you paint something like leaves or flowers clustered together they become a big focal point for your page. I love doing images like this using leaves – because they are easy to paint using just one round tip brush! I drew the calendar and lettered the word “June” before doing the watercolor painting because I used waterproof pens, but if you wanted you could watercolor first, and then letter over it! If you haven’t tried watercolors in your journal, you might be curious how the paper holds up from the back side. I took a photo on the backside of the “June” lettering with leaves to show you! Surprisingly, you are able to paint quite a bit without too much of the paper wrinkling effect! Tip: Try Winsor & Newton Cotman (Tubes or Palette Sets) if you want to save some money! 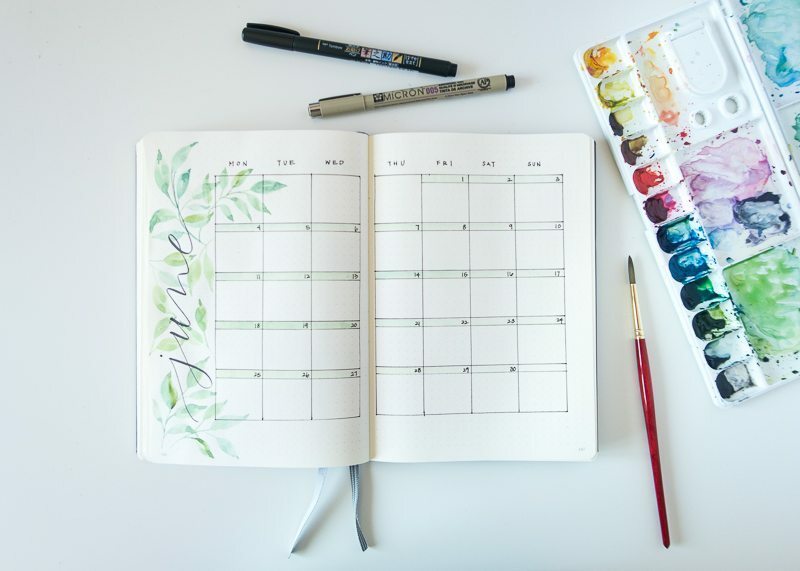 I hope that these ideas inspire you to try watercolors out in your bullet journal! I absolutely love watercolors and if you’ve never tried watercoloring before, I encourage you to test it out! Watercolors has a reputation of being difficult, but it really doesn’t have to be! My biggest piece of advice is to make sure that you’re starting off with the right supplies. This doesn’t mean it needs to cost a lot or be artists grade. However, there are big differences within the student grade market that you should be careful of! So many people start off with the wrong supplies and think that they are struggling because of their own inability to paint when it’s actually the supplies! Pick up my free watercolor supply buying guide and checklist where I share all my personal favorites! If you have any questions, feel free to reach out to me on Instagram @raeandlily or visit www.raeandlily.com/blog for more watercolor fun! Finally, a big thanks to Whitney for having me here on her blog! I am so happy someone with the expertise could share her insight on pretty-ing up your bujo pages. She seriously has me wanting to enhance my pages with these simple techniques. Even if you’ve never picked up a paintbrush in your life, you can start to mess around with these easy tips. Thanks so much Susan for dropping in! 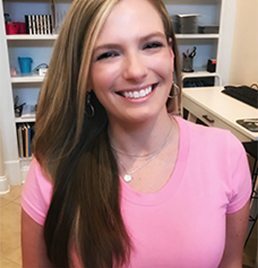 Be sure to visit her at raeandlily.com or check her out on Instagram @raeandlily. Have you tried watercoloring in your journal yet?? We’d love to see what you create! Tag us on IG to share your work! Thank you for this – I really want to start trying out some watercolor. I’ve certainly been too scared to try it in my notebooks! Nice tips…maybe now I’ll have the courage to try watercolors in my bujo. I really like the watercolor graphic illustrations. I’ve been wanting to try something like this for awhile. Great tips! I’ve been trying to use more watercolor in my spreads. I love the look and feel it gives to the paper in my leuchtturm1917. Thanks for the pointers! These are fantastic! I love the look. So this means I have no more excuses for putting off using my watercolours I guess… I’m excited, thank you! I love the simplicity that watercolor provides and the ways in which Susan suggests we can accentuate our pages. I think I can do this (at least the single swath over the month)! This is great! I’ve been wanting to try water colors for a while so these tips are great to get me on my way!